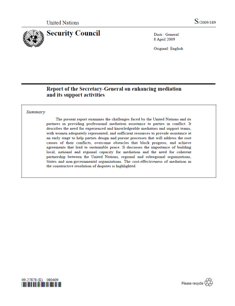 The good offices and mediation roles of the Secretary-General in the prevention and the peaceful settlement of disputes derive from the Charter and have been developed through extensive practice. These roles can be set in motion at the Secretary-General’s own initiative, in response to a request from one or more of the parties to a dispute, or as a result of a request from the Security Council or the General Assembly. Article 98 of the Charter provides that the Secretary-General, in addition to acting in that capacity in all meetings of the General Assembly, of the Security Council, of the Economic and Social Council and of the Trusteeship Council, ‘shall perform such other functions as are entrusted to him by these organs’. These often include functions in the field of the prevention and the peaceful settlement of disputes. Article 99 of the Charter provides that the Secretary-General may 'bring to the attention of the Security Council any matter that in his opinion may threaten international peace and security'. The role of the Secretary-General as an important peacemaking actor has evolved through extensive practice. The range of activities carried out by the Secretary-General has included good offices, mediation, facilitation, dialogue processes and even arbitration. The Secretary-General may take action himself or may appoint special representatives and envoys to carry out good offices and mediation on his behalf. 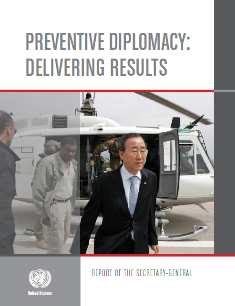 Numerous representatives of the Secretary-General also engage in peace talks or crisis diplomacy while overseeing UN political or peacekeeping missions in the field, which may have mandates to help nations and regions resolve conflicts and tensions peacefully.